Last updated 8. January 2018, 06:03. ​Norway exported 838,000 tonnes of pelagic fish worth NOK 7.7 billion in 2017. This is an increase in volume of 24 per cent and a decrease in value of 1 per cent from 2016. Norway exported 838,000 tonnes of pelagic fish worth NOK 7.7 billion in 2017. This is an increase in volume of 24 per cent and a decrease in value of 1 per cent from 2016. Norway exported mackerel worth NOK 4.1 billion in 2017. This is an increase of 1 per cent from 2016. The export volume increased by 9 per cent to 336,000 tonnes. NOK 2.8 billion worth of herring was exported in 2017, a reduction of 9 per cent from 2016. The export volume increased simultaneously by 24 per cent. - There has been a major decline in price for herring in 2017. This must be seen in light of larger quotas and increased competition for herring globally in combination with Norway's lack of market access to the traditionally most important market for frozen whole herring, namely Russia,” says Paul T. Aandahl, Seafood Analyst at the Norwegian Seafood Council. Poland was the largest market for Norwegian herring in 2017. Norway exported NOK 458 million worth of herring to Poland in 2017, a reduction of 23 per cent from 2016. The second largest market for herring was Germany, with a value of NOK 378 million. This is a reduction of 28 per cent. The third largest market for herring was Lithuania, with a value of NOK 334 million. This is an increase of 18 per cent from 2016. Norway exported 139,000 tonnes of frozen whole herring and 106,000 tonnes of frozen herring fillet products in 2017. Of the total export value of herring in 2017, frozen herring fillet products represented 50 per cent. This is 2 percentage points lower than in 2016. The average price on frozen whole herring in 2017 was NOK 6.87 per kg. This is a reduction of 29 per cent from 2016. For frozen herring fillet products, the average price in 2017 was NOK 13.51 per kg. This is a reduction of 19 per cent from 2016. For China, which is an important market for Japan for products processed from Norwegian mackerel, the direct exports of mackerel increased in 2017 by 27 per cent to NOK 830 million. The volume increased by 39 per cent to 71,000 tonnes. The exports to Japan, which were second largest, were reduced by 19 per cent to NOK 772 million. South Korea is the third-largest market for mackerel, and here the exports declined by 11 per cent to NOK 504 million. The volume to Korea declined by 1 per cent to 39,000 tonnes. Norway exported 323,000 tonnes of frozen mackerel in 2017. This is an increase of 7 per cent from 2016. The average price on frozen whole mackerel was NOK 11.92 per kg. This is a reduction of 8 per cent from 2016. Norway exported 198,700 tonnes of seafood with a value of NOK 7.8 billion in February. This is a reduction of 57,000 tonnes or 22 per cent in volume but an increase in the value of NOK 670 million or 9 per cent compared with February last year. 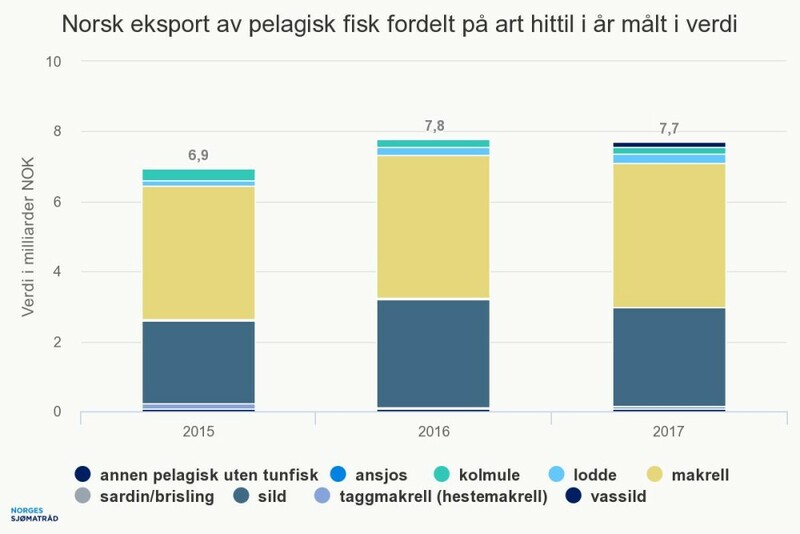 So far this year, 406,000 tonnes of seafood have been exported with a value of NOK 16.4 billion. In January 2019 Norway exported 200,600 tonnes of seafood worth NOK 8.6 billion. This is a reduction of 7,700 tonnes or 4 per cent in volume but an increase of NOK 992 million or 13 per cent in value compared with January 2018. Norway exported 251,000 tonnes of seafood worth NOK 9.9 billion in October. Compared with October 2017, volume was down by 12 per cent, while export value increased by 10 per cent or NOK 884 million. So far this year, Norway has exported 2.2 million tonnes of seafood with a total value of NOK 80.7 billion. Norway exported 276,000 tonnes of seafood to a value of NOK 9.9 billion in November. Volume fell by 8 per cent, while export value increased by 11 per cent or NOK 990 million compared with November 2017. So far this year, Norway has exported 2.5 million tonnes of seafood to a value of NOK 90.7 billion.